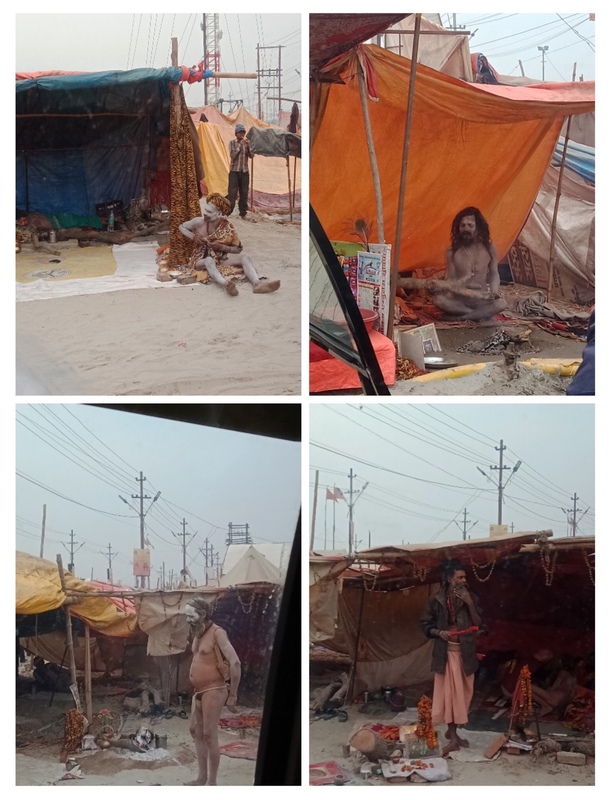 On Feb 7th, we visited the Kumbh mela at Prayagraj ….one of the items on my list of 50 for this year and our bucket list. The visit happened because Vandana’s friends were visiting on these dates and we immediately did the booking. We are so glad that we did visit the Kumbh because it was something out of this world – surreal, uplifting and definitely a spiritual experience. 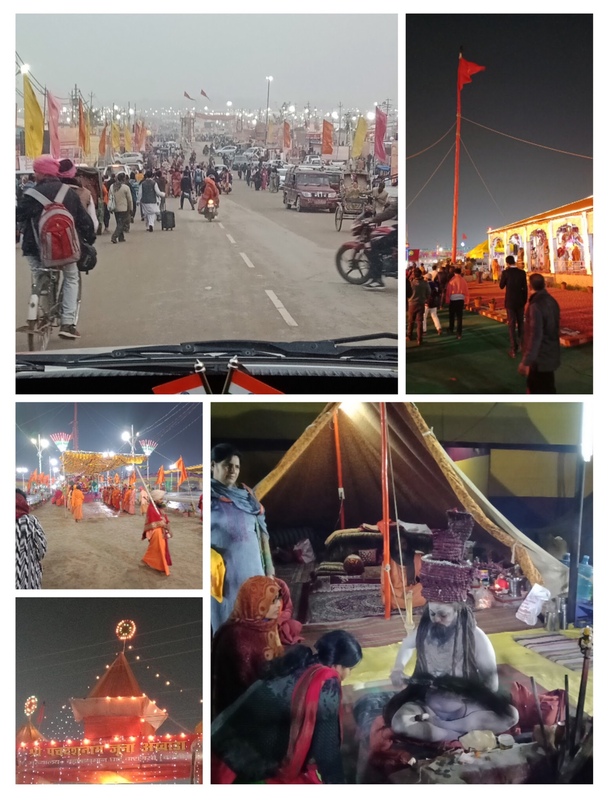 We are not uber religious people but there was definitely something different at the Kumbh that connected deeply. Its certainly not just a massive bunch of human beings there. A new temporary city has been set up at Prayagraj, over a 60 to 70 kms stretch, which has 250-km long roads and 22 pontoon bridges. The World’s largest temporary city !! The total number of pilgrims expected were 12 to 15 crores, but by Feb 5th (20 days into the Kumbh), 13 crore people have already visited. The whole area is lit up with over 40,000 LED lights. 119 countries have their flags flying in the Kumbh 2019. Visitors from 192 countries expected. 5000+ NRIs also attended during their Pravasi Bharatiya tour in Jan 2019. The festival is over 2000 years old… as the first written evidence of the mela can be found in the accounts of the Chinese traveller Xuanzang, who visited India during the reign of King Harshavardhana. 1,000 CCTV cameras are installed in the entire Kumbh mela area and there are video analytics being used for crowd management. The Akshay Vat (immortal banyan/ber tree) and Saraswati Koop (the cave where the River Saraswati supposedly flows into the netherworld) are open for viewing and offering prayers after 450 years… and remember this is a Hindu majority country and supposedly secular ! The Akshay Vat is the place where Hindus believe that Rama, Sita and Laxmana rested during their Vanavas and several other legends are involved. 800 special trains have been deployed for the Kumbh. For the Maha Kumbh in 2013, there were just 220 special trains ! The Prayagraj station has got a makeover in time for the Kumbh. Its clean, has escalators and ramps, excellent waiting lounges besides being colourfully painted . 122,000+ temporary toilets have been built … no open defecation and no one needs to wait. Nearly 13 computerised “Lost and Found” centres across the Kumbh temporary city and a few at important locations like the railway station. 40,000 RFID tags used for children under 14 to avoid losing them in the Kumbh mela. So all the Hindi movies of yesteryears where brothers were separated at the Kumbh is history. A new plot has to be thought of. Automatic Number Plate Recognition being used to track the vehicles as well. Nearly 2000 “Swachagrahis” or Sanitation workers employed and trained to keep the Mela area clean. Thousands of volunteers help the pilgrims at every step of the way. Almost 30000 cops have been deployed and you can see them in action everywhere. 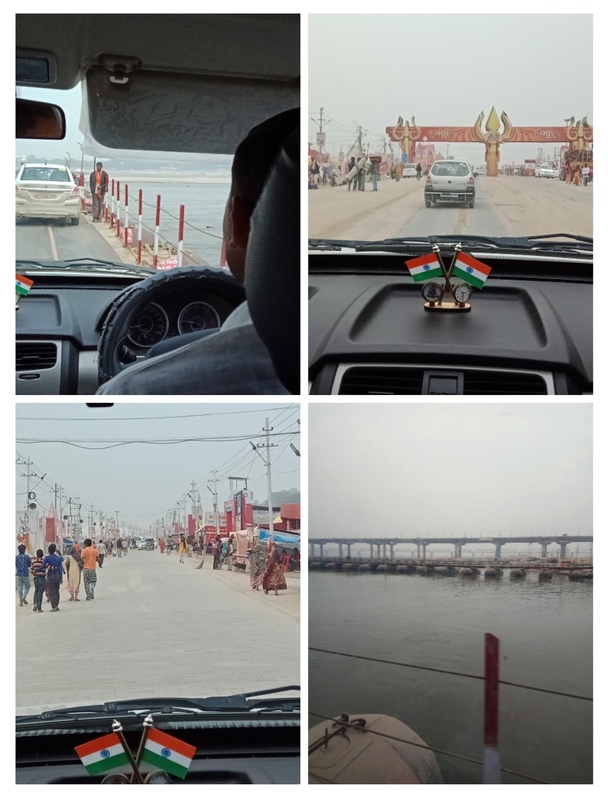 We booked a package tour for our Kumbh experience, that came with a trained guide and a car to ferry us back and forth. Our trip started with the “Snan” at the Triveni. We reached near the fort and parked the car. We had the option to take a shared boat (approx Rs. 125/- per person) or an exclusive boat and we chose a shared boat. All the passengers had to wear the life jacket and everyone did. It was slightly cold at about 2.30 in the afternoon when we started out. 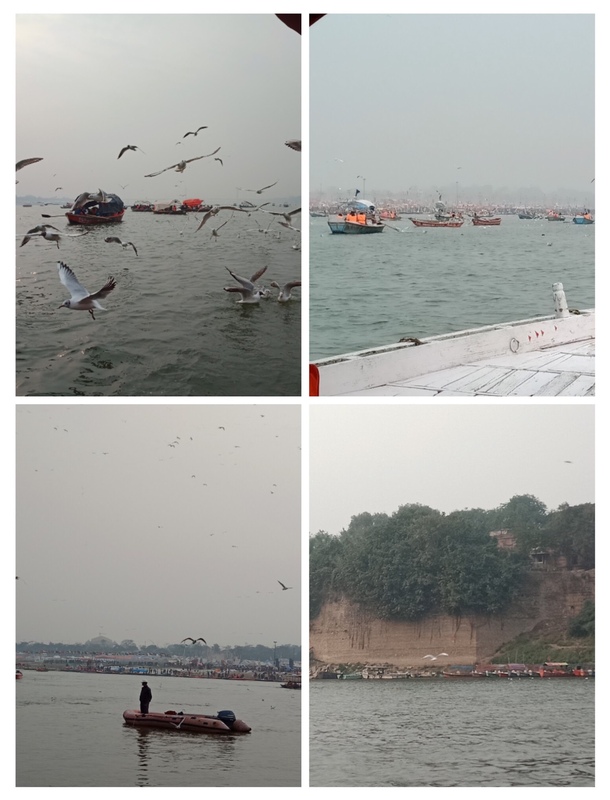 The “Siberian” birds that flock to the Kumbh 2019, and the Akshay Vat as seen from the boat. We decided not to stand in the queue to see the Akshay Vat as that would have taken atleast 2 to 3 hours as the queue was really long. The holy dip at the Sangam. A massive platform has been created for people to take the holy dip at the Sangam. The depth is just a couple of feet whereas the river just outside the platform is at almost 70 to 100 feet depth. The Delhiite in me couldn’t resist taking the dip in a Satya Paul saree ! :). The water was clean and cold but not extremely cold. 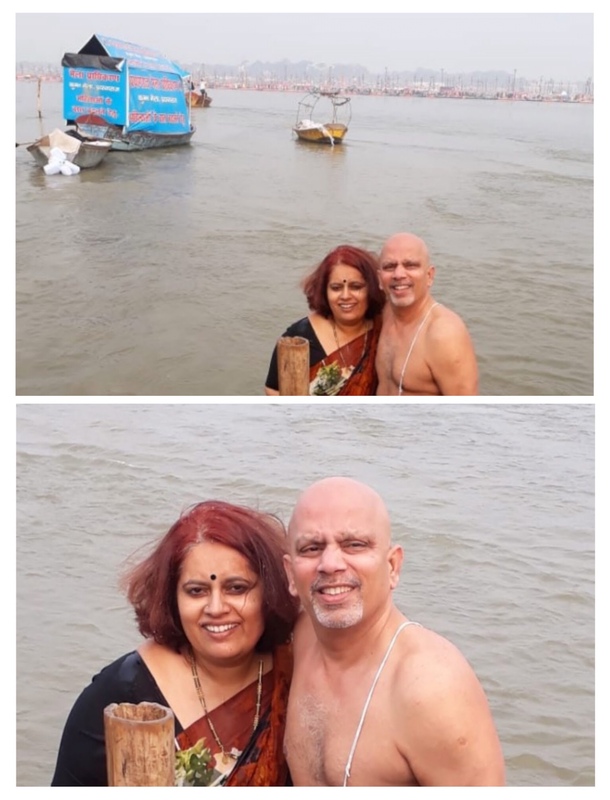 We took the dip and Krishnan changed into his dhoti in the boat, while Vandana and I changed into dry clothes at one of the changing rooms that dot the bank of the river. After the dip, we went to the “Bade Hanuman” temple and then from there to the Adi Shankara Vimana Mandapam, a 130 foot tall temple built in the south Indian style over four floors. It houses Kamakshi Devi (with 51 Shaktipeethas around), Tirupati Balaji (with 108 Vishnus arround) and Yogsahastra Sahastrayoga Linga (with 108 Shivalingas around) temples on each floor. 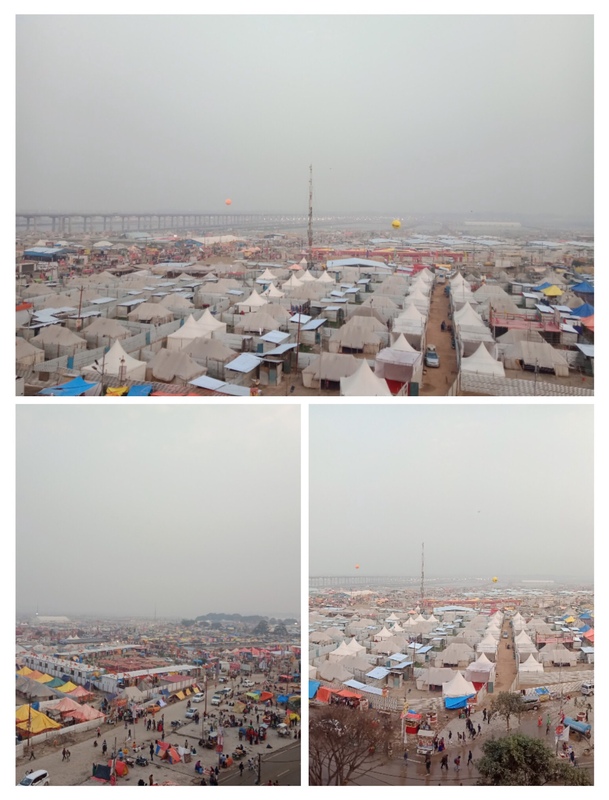 We took a picture from the top floor of the entire Kumbh Mela area. We got excellent tea in kulhads just opposite the Shankara Mandapam and it was much needed. From here we went to see the Akharas, the main attraction in any Kumbh mela. Read more about the Akharas at this wikipedia link – https://en.wikipedia.org/wiki/Akhara. We visited the Nirmal Panchayati, Udasina and Juna Akharas. They are fascinating and since we didn’t have enough time, we didn’t actually talk with any of the saints or Naga Sadhus at the Akharas. The Akharas. The Naga Sadhu in the last pic blessed us with “vibhuti” or sacred ash. After walking around in the Akharas, we were ready for the awesome food at “Netram”. We drove down there and ate up the Poori (Kachori) and subzi with relish. The driver and the guide also enjoyed their meal with us. 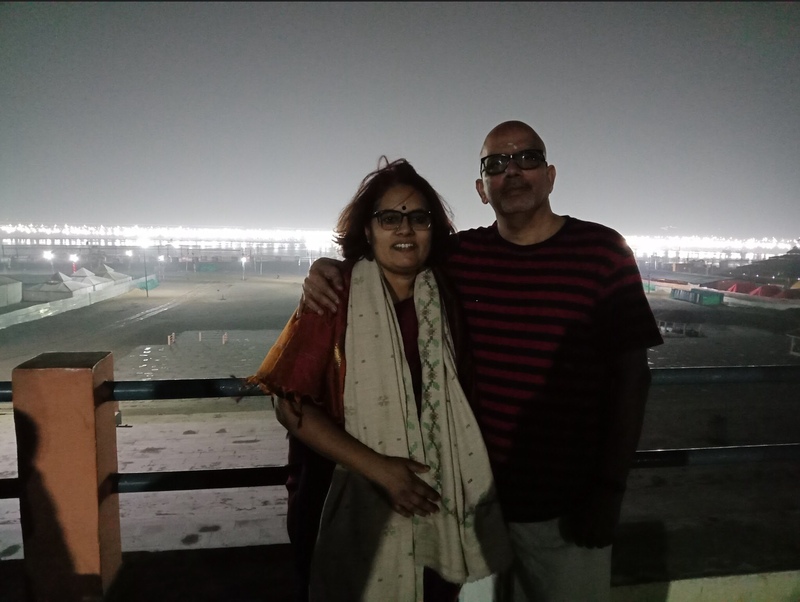 As we drove back to the Kumbh Village, we stopped on a flyover which was beautifully lit up and took a few pictures and then stopped again at the view point to take a few more pictures of the Mela area. 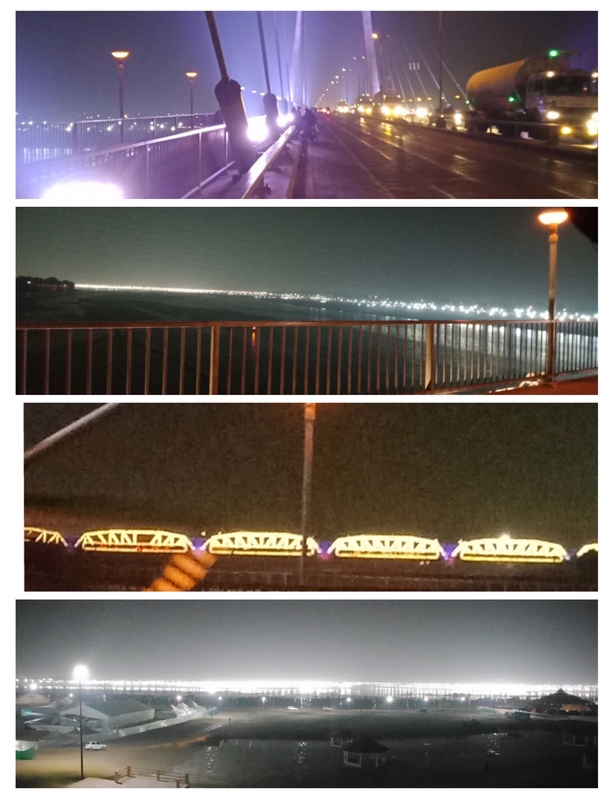 The bridges and flyovers all decked up… view of the Mela area at night from the view point. The lit up Mela grounds in the background ! Surreal and beautiful. Our Kumbh trip was done and what an experience it has been ! Anyone wanting to do a MASSIVE project should stand in line and learn from the UP CM Yogi Adityanath and of course our beloved PM Narendra Modi. The Kumbh is just unbelievably well organised. The place is clean, no littering, so right here there is hope that India will be a clean country soon. You also feel a tremendous sense of pride that such a MAMMOTH event has been organised flawlessly. The fact that an auto driver apologised to a traffic cop in the city of Prayagraj gives Krishnan and I tremendous hope that U.P will soon be out of its “unruly” tag, all thanks to Yogi. Whoever said that a saint cannot be a great administrator can go take a walk wherever they feel like in the city of Prayagraj and see what a “Yogi” can do – its genuinely mind blowing. We will certainly be back for the Mahakumbh in 2025 and hope that Yogi Ji is still the CM of the state because that would mean an even bigger event organised even better ! Divya Kumbh, Bhavya Kumbh indeed. Please do visit and see for yourselves. Bindu KRISHNAN, as usual your blog was interesting to read and the details of the arrangement at Prayag Raj is astonishing !